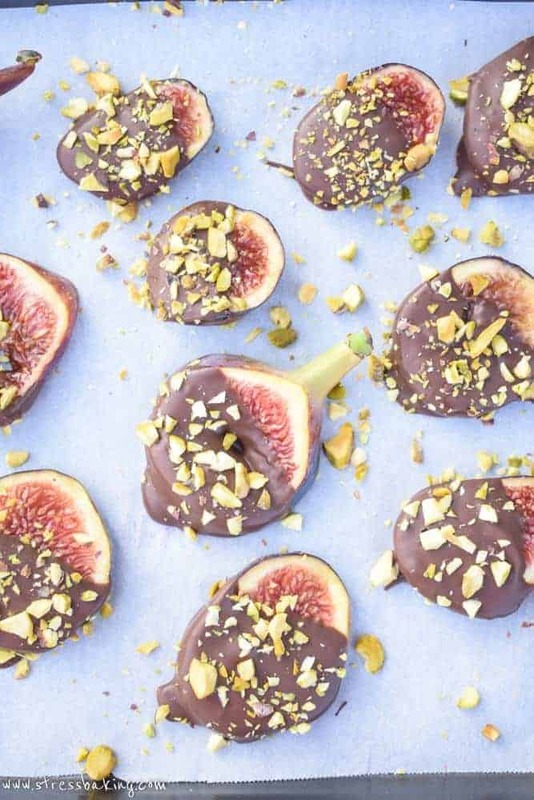 Sweet, syrupy figs are gently dipped in dark chocolate for a perfectly light dessert! I’m not gonna lie to you guys… I’m tired. Like, down to my bones tired. The idea of typing up this post even seemed to daunting to my tired fingers and strained eyes. I was walking over to my computer whining, “I don’t wannnaaaaaaaaa”. And then I saw a news clip about Houston and felt like a complete and total jackass. There are people who are currently homeless and have lost every possession they had. Their homes are literally underwater. Some people lost their pets and loved ones. There are families who have been forced to evacuate and have nowhere to go but a furniture store that’s been turned into a shelter. Leslie… YOUR PROBLEMS ARE NOT PROBLEMS. PERSPECTIVE, WOMAN. I’ve cried watching videos of Houston’s situation. I’ve donated money, I’ve donated clothes, I’m donating all the profits from my “Cupcake Love” products this week, I’ve checked in on friends I know in Texas… I’ve done just about everything I can from my home in Massachusetts. So, here I am. Talking to you about food. 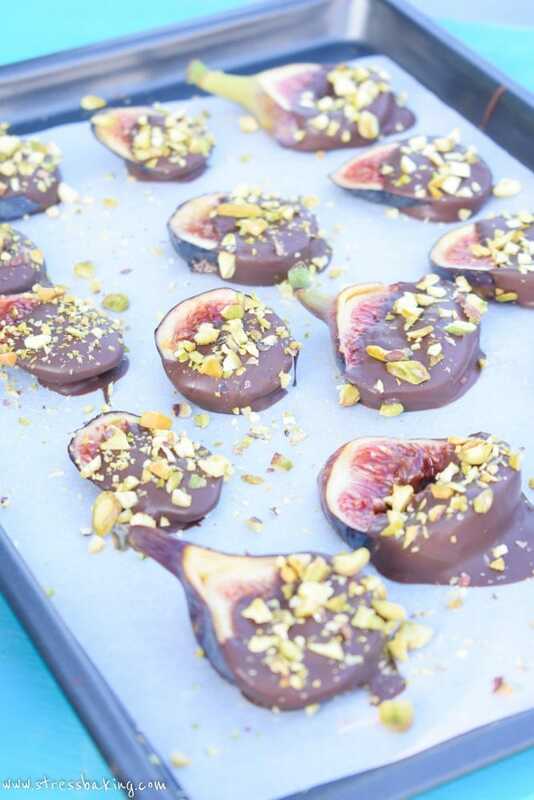 I’ll try to turn this vibe back around to something happy – like these dark chocolate covered figs. 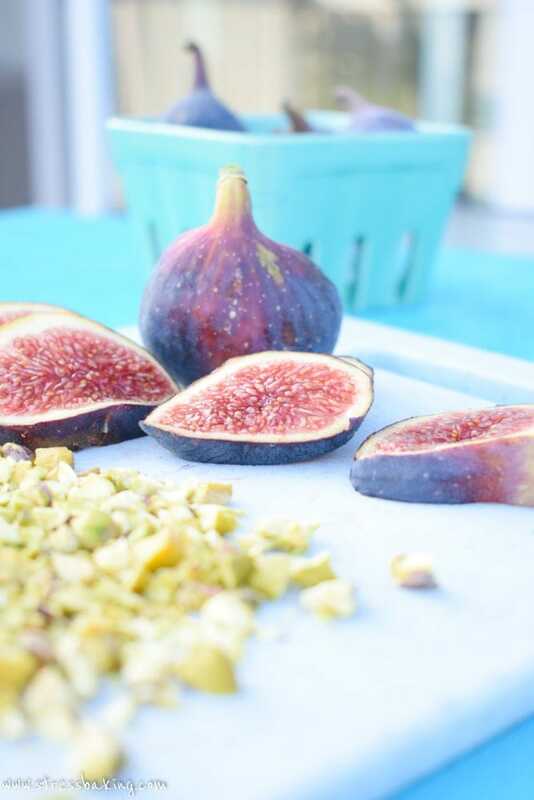 People seem to either love or hate figs. I’ve never talked to anyone that said, “Eh… they’re okay, I guess.” So if you’ve made it this far and you don’t like figs… um, you’re great and all but why are you still here? 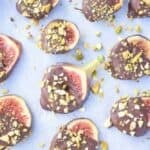 Are you going to make these for your SO because they love figs and you love them? Are you just scrolling for the pictures because you are an equal opportunity food lover? Are you just reading to see if I write something completely inappropriate? I’m happy to have you as a guest regardless. They’re easy to make and have this consistency that I love: slightly chewy, with a crunch on the outside. So good. 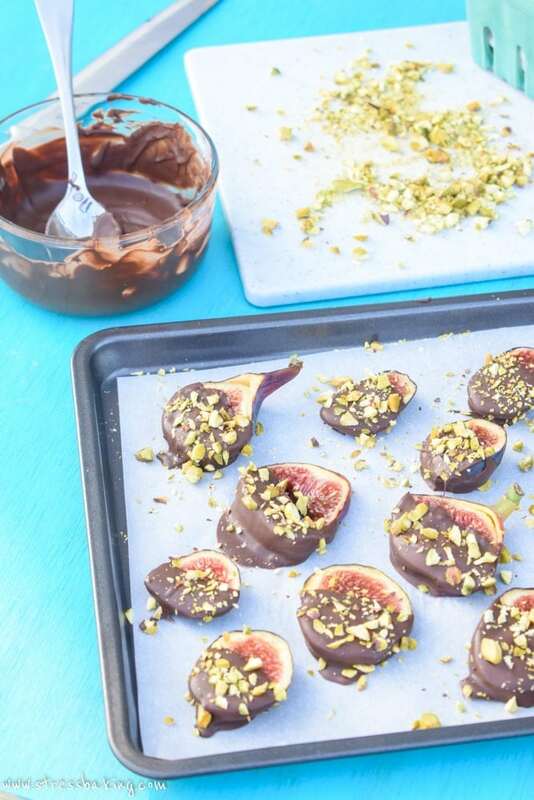 By no means do you have to use dark chocolate – use whatever kind you like! I just always go for dark chocolate. The darker, the better. that’swhatshesaid. Oh hey, look – if you were here for the inappropriateness, there ya go! You can now go back to your regularly scheduled internetting. You also don’t have to add crushed pistachios. You could use a different nut, or shredded coconut, or some caramel, some sprinkles, or absolutely nothing at all. Totally up to you. This is a choose your own adventure game, featuring food, which automatically makes it a million percent better. Making this recipe is so easy that I almost feel guilty calling it a recipe. So just to pile on, I figured I’d make a video for it, too. You know, just in case you’re a visual person who wants to watch me putz around with ingredients on a windy day on my deck. Side note: While I was recording this, the ice cream truck was going by and I was yelling about how badly I wanted to go rob that guy of a Choco Taco. Screaming and ice cream truck song not included. Prepare a baking sheet or other platter with parchment paper. Set aside. 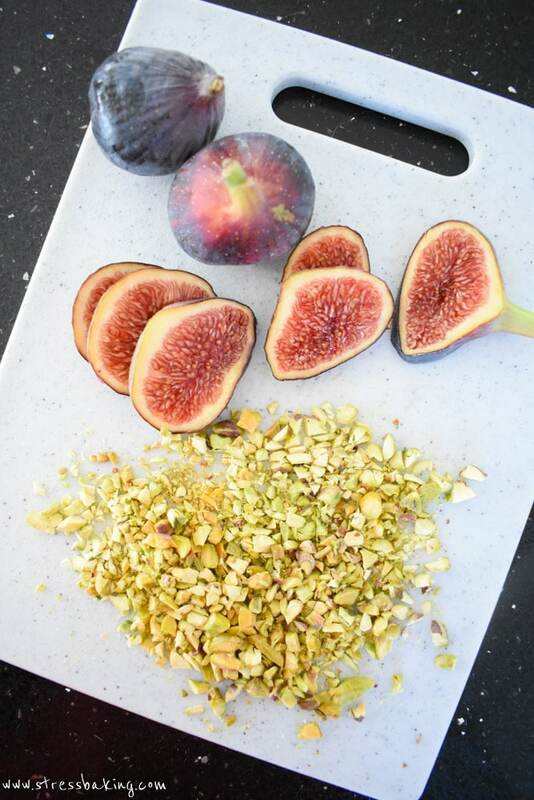 Slice figs into 3-5 slices. 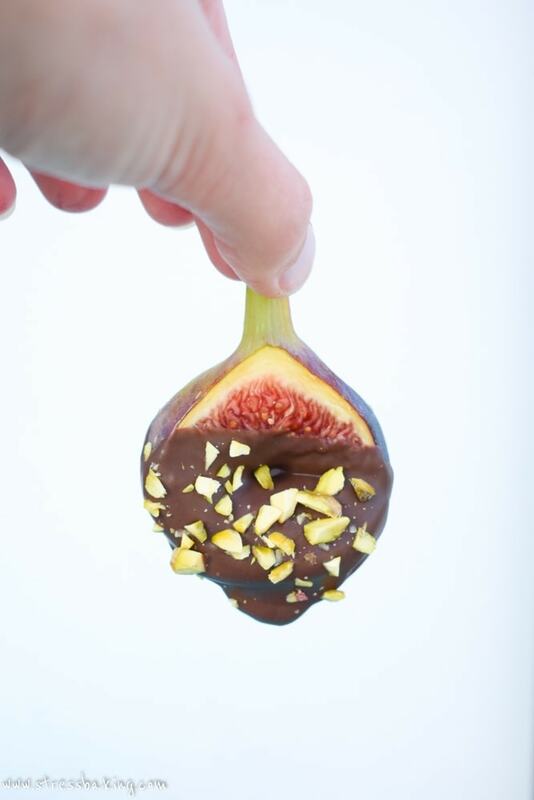 Dip figs in melted chocolate, using a spoon to help spread the chocolate as needed (as much or as little as you want – leaving a little bit of the tops of the figs exposed just looks nice!). 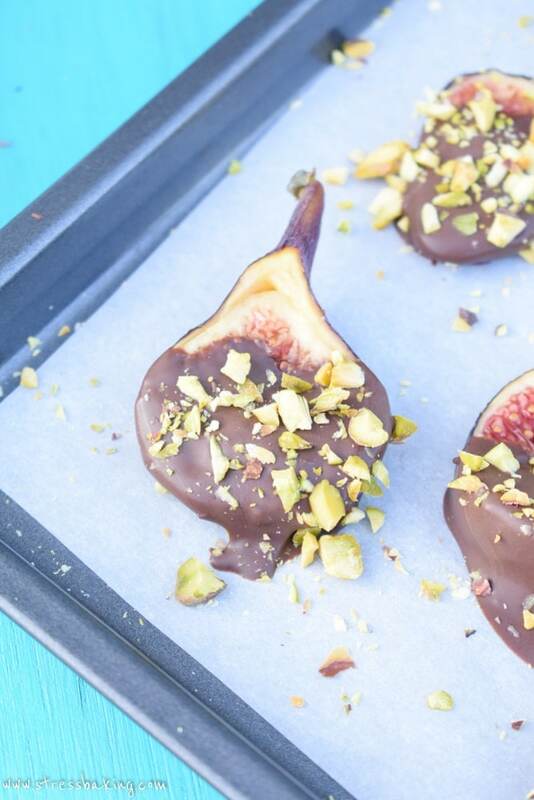 Place the chocolate-covered fig on prepared baking sheet. Immediately cover with crushed pistachios. Let set, serve and enjoy! Note: Can be stored in the fridge for up to 3 days, but best served same day.